The squad list for Sunday’s Round 3 FBD League clash with Roscommon at Hyde Park on Sunday (throw-in 2pm) was released a bit earlier on and it’s the same 23 players that were on duty in Ballina last Sunday. Full details here. It’s clearly the right time of year for experimentation – and I’m hoping to see the likes of Matthew Flanagan, David Kenny, Padraig O’Hora, Shane Nally, Caolan Crowe, Darren McHale, Keith Ruttledge and Conor Loftus in action when I get to Hyde Park on Sunday – but, while it’s great to see the new (and, in some cases, not-so-new) faces getting game time, it’s also the case that at least some of this is a necessity, given who is and who isn’t available right now. In this respect, the Mayo News (paper and digital versions) had an instructive piece this week where they listed 26 players (an entire match-day squad, in other words) who are either injured, out of bounds due to club commitments or otherwise unavailable at the minute. Some of these are likely to be back soon enough – in a separate Mayo News piece this week Stephen Rochford states that he’s hopeful the likes of Aidan and Conor O’Shea, Diarmuid O’Connor, Evan Regan and Stephen Coen could all be back for the first round of the League against Cork – but a good number of those currently ruled out are likely to remain so for some time. 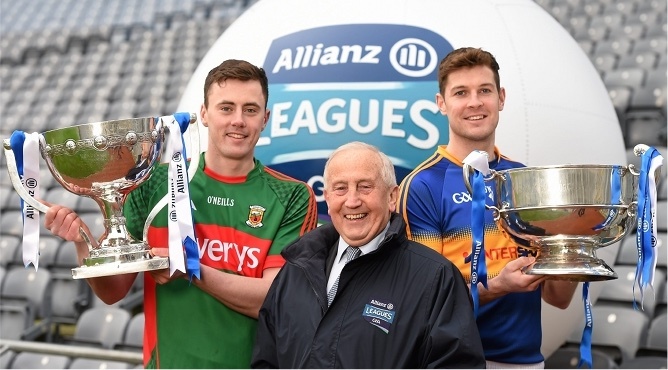 In separate news, Diarmuid O’Connor took part in today’s official launch of the Allianz Leagues at Croke Park, where he expressed the desire to see us make the improvements that will enable us to push on and reach the summit this year. And so say all of us. I can’t, Mayo 51 – as I said in the post, the article is in the print and digital variants of this week’s paper, it’s not online. From what I’ve seen so far of the newcomers, David Kenny would be my tip to make the break through this year in the backs. There’s no reason he can’t put it up to the more established players. He’s a vey natural looking defender and it’s there for him to take the shirt. Obviously it would be a huge step up, but he has the invaluable experience from ’13 under his belt. Freshening things up in the back line like this might be no bad thing…we’ve become predictable especially to the top teams. I was half listening to Kevin McStay on RTE’s “Off the Ball” or whatever they call it this evening and I thought I heard him say that the game might not be in the Hyde after all given the weather. I may well be wrong about that but if it is the case the only alternative as far as I know in Rosc is Kiltoom which might not accommodate the expected crowd. I expect it will be at least treble what we have had in games to date. Last year’s minors have been taking some flak on the previous thread which, having been at their only game, I think is not justified despite the score. They were going quite well until the Captain, Barry Duffy got injured. When he went off it meant that we were without our two first choice midfielders. [David Hanley of Burrishoole had been ruled out at the start]. Sharoize Akram was also ruled out at the start and you need to have seen him in U21 this year to realise the loss he was. The loss of these players also left the team without any championship experience. Along with the blow to Mayo morale Galway smelled opportunity, upped their game and, as proved subsequently, played well above themselves. Everything seemed to go right for them. Incidentally, as well as Akram, Barry Duffy, James Lyons and James Carr of that team have fielded at U21 so far this year. An Andy, I was the game too and they were abysmal. Yes, they had some injuries which definitely weakened them, but when a team gets hammered like that, there’s not too much of an argument you can make. All belief seemed to leave them once Duffy went off and Galway opened up a gap – they were stuck to the ground whereas the Galway lads were barely touching the grass as they flew around the field. Maybe it was over-training, maybe the just collectively froze, maybe they were just a poor team. In any case, it was a terrible performance. T’was surely Tubber but missing two or three top players at that level,at that stage is sure to be more that unsettling. And then there was the absence of any players from the Co. Final……still a slight mystery. I’m sure next time we see them together it will be a different story! That’s 49 players in the mix at the moment, and very few of them look out of their depth. Interesting few months ahead when it comes to trimming the squad, there could be some big name casualties! Ballina’s Jack Irwin was the sub introduced for Barry Duffy v Galway so it’s not true to say that there was a total absence of players from the Co Final. I was also at the Co Final and no player stood out as an obvious oversight from the Co panel. It is unusual but by no means exceptional for County champions to have no representative on a county panel. If anybody disagrees with my assessment they should be able to say who should have been included. And I will remember to look out for them for the next few years. I will be watching Padraig O’Hora’s progress over the coming years closely. He might need another year to make a big impact but I think he has the dogged style that’s needed in a corner back. He has no interest in going forward, is an old school tough man marker (note no gloves, jersey not tucked in and socks around the ankles) and by all accounts is relishing the opportunity to mark some of our big names in training when they return. I would like to see Keith Higgins returning up the field this year and Kevin Keane given an honest shot, he didn’t put a foot wrong in the league and for the life of me cannot understand why he wasn’t brought on to counter act McManamon in the drawn game, something he has done previously, including the league game in Castlebar. As has been said here numerous times, we are scoring enough to win any game, it’s what we concede that is costing us games. Andy D I was at the county final and most of the minor championship games if you tell me that Mayo has or had 30 players under 18 better than Colin Gill and James Mc Cormack from Claremorris then Mayo football is going to be in a very strong position for at least 10 more years. Thanks Liberal Role and Liam. I had posted earlier about what I saw as lack of prospects in the full back line. Delighted to see those views challenged with very positive assessments of O’Hora and Kenny. Does anyone else support the positive views on these two? I remember Kenny of course for 2013, and I feel the fact that he is a dual player is also advantageous; the hurling give a player an added dimension. The thing that was most disappointing about Mayo minors trimming last year was the fact that Galway later proved to be less than great themselves, needed a replay to beat Sligo and then well beaten by Tipp in the quarter final. I was told last weekend that the game was ” provisionally” fixed for Hyde Park. It was probably for capacity reasons, that the game was switched from Ballinlough. Don’t rule out a trek to Kiltoom. THE following 26 players were not available for selection for Mayo’s squad last Sunday. Tom Cunniffe, Paddy Durcan, Donie Newcombe, Eoghan O’Reilly, Ger McDonagh, Barry Moran, Danny Kirby, Neil Douglas, Stephen Coen. 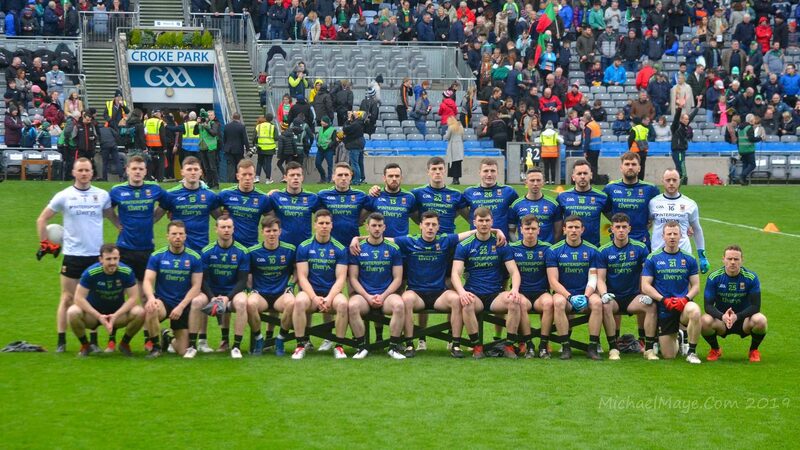 Chris Barrett, Cathal Carolan, David Clarke, Mickey Conroy, Alan Dillon, David Drake, Michael Hall, Andy Moran, Cillian O’Connor, Diarmuid O’Connor, Aidan O’Shea, Seamus O’Shea, James Stretton, Mikey Sweeney. Alan Freeman, Conor O’Shea, Evan Regan. As far as I can rem there was a Gill at midfield and the no 6 was impressive, scoring two points for Claremorris. There was also a Molloy at 6 for Ballina who really stood out in a poor team. We can be looking out for them. Problem is,sometimes you can lose players like that. Somebody on Gaa Board claims the match has been switched to Mc Hale Park. Is this true? Why is the match switched to Castlebar – is it the poor condition of Hyde Park, or are they expecting a very large crowd ?